♔ Do you want a Sports Earbuds with Noise Isolating? ♔ Do you want a Sports Earbuds with Good Sound Quality? ♔ Do you want a Sports Earbuds with Comfortable Wearing? CHOOSE US! Diivoo Sports Earphones with Mic, come with super sound and Noise-isolating comfortable to wear, Enjoy your perfect music life. Good sound quality for music and phone calls is clear and crisp. This Diivoo Sports Earphones is what you've been searching for. Earphones fit comfortably and never fall out when you are running, jogging, walking, weight lifting, enjoy your music world with our in-ear Earbuds wherever you are. Our Sports Earbuds includes small, medium, and large ear gels that perfectly conform to the contours of your ear for all-day comfort. That actively prevents tangling! 1. If you aren't completely happy with our Earphones, simply return them within 30 days for a full, no questions asked refund. 2. For any technical support or inquiry, please feel free to contact Diivoo Customer Care Team. ♬ 【SUPER FIT SPORT EARBUDS】 ♬ - Thanks to pliable over the ear loops and ergonomic ear bud design, our Sports Earbuds fit comfortably and stay put in ears while running, jogging, weight lifting, erxercising, walking and gym training. No need to stop your workout to adjust the earphones any more. Diivoo Sports Earbuds born for the people who loves sports! ♬ 【HANDS-FREE PHONE CALL DURING RUNNING】 ♬ - You can use the in-line button to answer/end phone calls with Diivoo Sports Earbuds. The microphone on this earbuds allows you to communiate hands free, so that you can keep on your exercise. There's a clip which will help you stabilize the set while doing different physical activities. You deserve to have this earbuds! 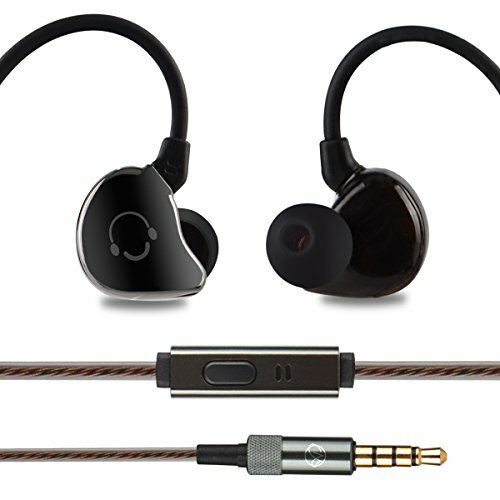 ♬ 【GOOD SOUND QUALITY EARBUDS FOR MUSIC AND PHONE CALLS】 ♬ - The sound of these sport earbuds is clear and crisp. They are good for listening to music during workouts, as well as listening to audio books or video during commute. Call quality and mic is good. You can hear the person on the other end clearly even on a noisy treadmill with this earbuds. Diivoo Earbuds is fully compatible with iPhone, iPod, iPad, mp3, smartphone, laptop, computer, tablet, psp etc. ♬ 【COMFORTABLE EARBUDS TO WEAR】 ♬ - Comfortable over-the-ear design and super light weight makes this Sports Earbuds comfortable to wear, while Diivoo Earbuds fits securely on your ears. Diivoo Earbuds will never fall out while you walk or run. With this earbuds, you can do exercise while listen to music at the same time! ♬ 【100% MONEY BACK GUARANTEE】 ♬ - Diivoo Earbuds offers Two-year hassle-free money back guarantee, If you are not satisfied with our wired earbuds, let us know and you will be offered a full refund or replacement earbuds. Enjoy this absolutely RISK FREE purchase by clicking the yellow "Add to Cart" button. If you have any questions about this product by Diivoo, contact us by completing and submitting the form below. If you are looking for a specif part number, please include it with your message.